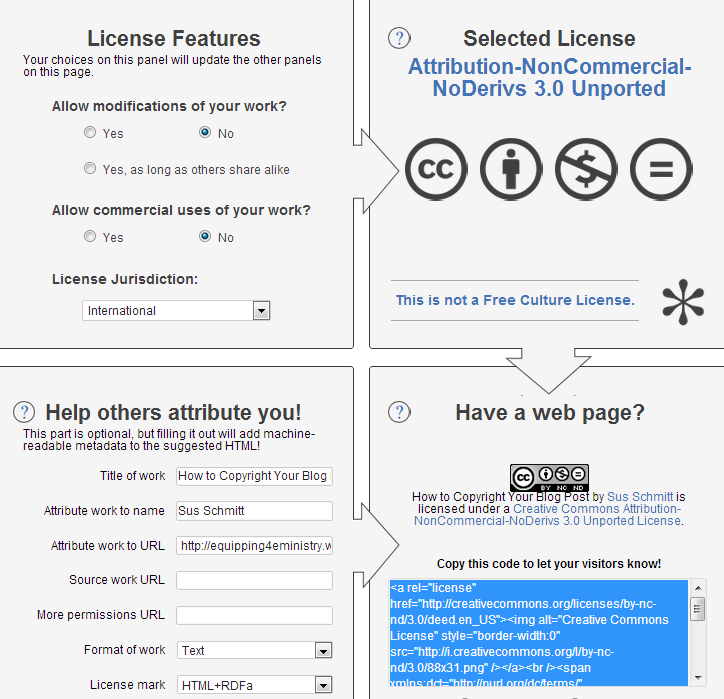 According to Creative Commons, your original content on your blog post is automatically copyrighted. You still might want to make your desires clear to readers who’re interested in using your material. Your simplest option is to put a copyright notice in the footer of your blog to cover all the content of your blog. You could also choose to put a copyright symbol at the bottom of every post or under a photo. To make the copyright mark, just use the “insert custom character” feature in your blog editor (In WordPress, the icon looks like an omega: Ω). Insert the copyright symbol and type the year and your name… © 2013 Your Name. How to Copyright Your Blog Post by Sus Schmitt is licensed under a Creative Commons Attribution-NonCommercial-NoDerivs 3.0 Unported License. You’re welcome, Monica. I think that license picker is a pretty cool tool.